I have a love-hate relationship with the grocery store. On the one hand, I love wandering the aisles, exploring the produce, considering local jams and baked goods, being tempted by treats of all kinds. On the other hand, I don’t have access to a car most days of the week, so getting to and from the store can be a pain, and sometimes, I just don’t want to have to plan my meals or buy more apples or leave my house at all. 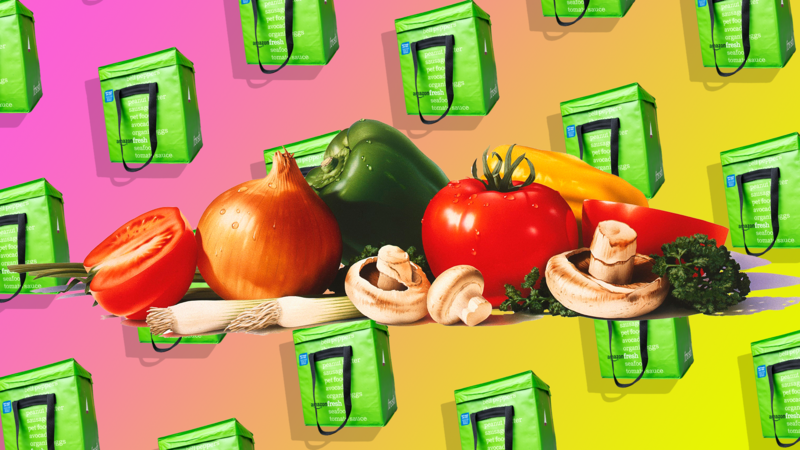 Enter AmazonFresh, Amazon’s grocery delivery service. First, the basics: AmazonFresh is $14.99 a month if you are already a Prime member, which I am. That fee gives you access to a whole list of products that can be delivered to your door during a certain time slot, and delivery is free — tip recommended — as long as the batch of grocery items you’re buying comes to over $50. If not, there’s a $9.99 delivery charge. The service isn’t available everywhere, but is in most big cities. For our order, I got a few essentials I’d been putting off, like sour cream, tortilla chips, salsa… basically the essentials are the ingredients for nachos. I also added in things like milk, ravioli and an all-purpose cleaner. Here’s what I loved and hated about the AmazonFresh service. Loved: Milk, eggs, salad, salsa, apples, oranges, avocados… all delivered to my door? OK by me. Hated: You could probably put together a few simple meals from the available items, but I wouldn’t rely on it for anything but the most basic ingredients. Plus, the experience felt a little… stale. Am I just used to having 35 options for salsa? Probably. They didn’t have the tea I wanted or many teas to choose from at all, actually, and while they had some “natural” products, the ones that were available didn’t capture my interest enough to actually put them in my cart. But more important, the shopping experience is clunky. They try to give you a “shop by aisle” experience, but it’s hard to tell if you’re seeing their full selection, and it often didn’t make sense why things were listed in the order they were. Loved: As with most things on Amazon, the prices for Fresh items were reasonable, if not cheaper, than many grocery store options — especially when it comes to booze. I don’t drink, but one of the first things my husband put in the cart was a 12-pack of beer and a bottle of whiskey, which came to more than $10 less than it would have anywhere else. Yes — you can get booze delivered, though someone over the drinking age with a legal ID will have to be present to receive it, and it’s not available in all states. Fresh is also paired up with Whole Foods, which Amazon owns. Many 365 store-brand products are available — things like mustard, salad mixes and cooking oils — and it expands the service’s natural and organic offerings. Another nice feature? Many of the product prices are broken down to a per-ounce cost, making it easy to comparison shop. Hated: Hate is strong, but just like your regular grocery store, Amazon is counting on you to impulse-purchase small sugary treats at checkout. Unlike your regular grocery store, they happen to know your favorite flavor of ice cream and are happy to remind you to grab some, dang it. Loved: The items showed up in big paper bags and were kept cold with frozen water bottles, a nice touch over totally useless disposable freezer packs. Amazon does a relatively good job keeping packaging to a minimum, although there were definitely a few errant plastic bags, mostly surrounding the produce. And, yes, the produce: The apples and strawberries I ordered were perfect, and the avocado (I know the main thing you’re concerned about is the avos), which I initially feared was overripe, was perfect as well. Hated: The only complaint I have is the bananas. The bananas were green. Like, shockingly green. Like, it’s a full eight days later, and I still cannot eat these green bananas. I can’t hate on the service. We ended up ordering another batch of groceries this week when I couldn’t make it to the store before we had a bonfire party, although I won’t kid myself into thinking I won’t need to make runs to the grocery store in addition to the delivery for the rest of the week. Although it’s definitely not the same as a grocery experience even with their Whole Foods integration, if you’re limited in where you can drive during the day for any reason or just like convenience, it’s worth it, and the price is right.